But when is Twelfth Night? And, more to the point, what on earth is it? There is some disagreement as to when Twelfth Night is. Some sources state that it is the night of 5th January, others that it is the night of the 6th. Exactly when Twelfth Night is may still be a matter of debate, but what it is can be defined with a lot more ease. As with much else to do with Christmas, Twelfth Night mixes Christian and secular traditions. 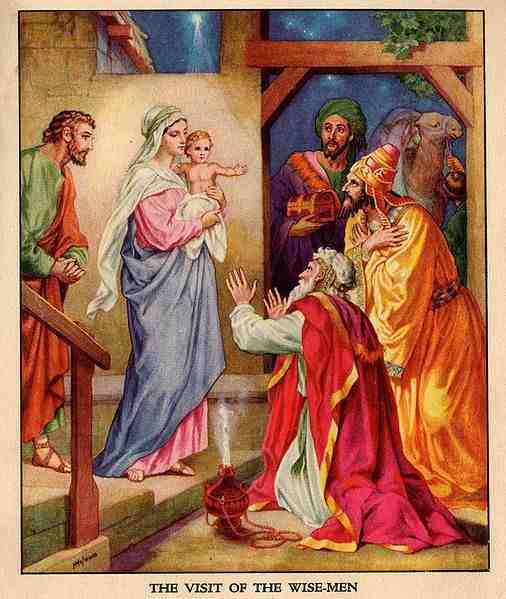 For most Christians, it marks Epiphany (meaning ‘to show’ in Greek), which commemorates either the baptism of Jesus, or the visit of the Three Wise Men. It also marks the end of the Twelve Days of Christmas, which began on Christmas Eve (hence ‘Twelfth Night’). However, to most normal people, Twelfth Night was the culmination of much Christmas partying and the time for giving and receiving presents. This was particularly the case during the medieval period, when Christmas was celebrated as much as a secular festival as a religious one, and (unsurprisingly) contained traditions that dated back to pre-Christian times. For example, great fun was had in turning the normal rules of society on their heads during the Christmas celebrations in reversals much like those seen in Shakespeare’s Twelfth Night. Masters would become servants and vice versa, all under the watchful eye of the Lord of Misrule, chosen by lot to be king of the Christmas feast. This character was often associated with the tradition of a Twelfth Cake, the recipe for which is similar to the modern Christmas cake but with two important added ingredients: a bean and a pea, which represented important concepts of fertility, harvest, health and prosperity for the coming year. The party guest who receieved the slice with the bean became the king of the feast, and the finder of the pea was his or her queen. Both would receive a ‘crown’ and would lead the party in feasting, mayhem, masks and disguises – and large amounts of booze! Food and booze were, then as now, central to the celebration of Christmas, and medieval Twelfth Night feasts were no exception to this rule – particularly if you were a royal. Spectacular, multi-course banquets would be served to the royal family and their aristocratic friends at the court, and (if you were lucky) the left-overs would be distributed to the poor and needy living in the vicinity of whatever palace happened to be the site of that year’s Christmas court. Then there was wassailing. To go wassailing was to take part in a tradition that dated back long before the emergence of Christianity in Britain. Wassailing was an integral part of the Twelfth Night celebrations (as well as all through the Twelve Days of Christmas, and involved carol singing either house to house, or, in rural areas, also in orchards, where local wassailers would sing to the apple trees in the hope that any evil spirits lurking around would be banished and the trees would be fertile in the next year. Wassailing would always involve a great deal of alcohol, usually given by local householders to the carol singers in order to warm them up – and in particular, this would be the wassail itself, a warmed, spicy, very boozy concoction which would be pretty much guaranteed to take the chill out of your bones and make you sing louder! The origins of the term ‘wassail’ seem to have alcoholic roots too, probably dating back to an old Anglo-Saxon toast that roughly translates as ‘good health’, a concept right at the heart of the practice of wassailing. Love your recitation, love Twelfth Night (the play) and I love Yule celebrations. I didn’t know about having to take down the decorations, though. Most people in US take them down by Jan 1, but I’m always late getting them up; so take them down later (probably this weekend). I’m planning to go to a Greek Orthodox Christmas concert on Sat, and with many recent eastern european and middle eastern immigrants the dates are all over early January. Then there’s New Year’s, very big among Asian immigrants and secular Jews. Then in February, there’s the real Asian Lunar New Year (Tet in Vietnam). We enjoyed some wassail drink this year at our friend’s party on Boxing Day and wassailing at our (yearly) party, which involves lots of carol singing on Jan 2 because we were too busy in December. I have long felt that people need to take the entire month of December off and make the solstice a rite. I loved Prof. Tolkien’s descriptions of Hobbit Yule festivities so clearly about trees, and your description of the apple orchard. The tree thing is clearly important. Thanks for your comment Alice, it is always interesting to read what you have to say :) BTW, If you’re interested, I posted a blog about the Solstice and other midwinter festivals on 21st December. Yes, it’s a common superstition in Britain that the decorations must come down by the end of Twelfth Night or you risk bad luck, although the precise historical origins of this tradition are difficult to pinpoint! As you know, early January marks the celebration of Christmas for many Orthodox Christians, mainly due to the fact that some churches in some parts of Europe still use the Julian Calendar, which is twelve days behind the Gregorian Calendar most of us use. You’re right, December should be a celebration month as there are so many festivals (all with similar aims) all throughout the period! I very much agree with you about how wonderful Tolkien’s descriptions of the Hobbit Yule are; his expertise in ancient languages and mythologies give that a real sense of authenticity. You are right when you say that trees are central to the whole thing, and they are highly symbolic at this time of year, very much representing the same hope for a fertile new year which lies behind the purpose of most midwinter festivals around the world.